As compared to last year things seem far more peaceful in the Valley. Is there any particular reason for the change? I don't think it would be possible to pinpoint one single reason. I think agitational fatigue would be an important factor. The past three summers were troubled for various reasons with no concrete results emerging from the agitations. Particularly last summer, the agitation was built around the Kashmir Chodo campaign but the only people who left Kashmir were the Kashmiris who could get away. I have friends whose children shifted to schools in Delhi and Jammu. Business too moved out. We lost an estimated 40,000 jobs in the private sector; finance companies closed down and the tourism industry declined. Around 118 people died because of these agitations but there was nothing to show for it on the ground and that was obviously a factor. Was there any change in your government's strategy as compared to last year? We have clearly been better able to respond to situations as they develop. Last year, perhaps, we tended to ignore the smaller issues thinking that nothing big will come out of them. But we realised that it is really the small things that add up to one huge, big issue. So administratively, politically and even from the security point of view, our handling of situations is definitely a lot better now. We have also tried to show people the benefits of peace, starting with panchayat elections and then with all round development. It's a fact that there is hardly a corner in the state where some activity or the other isn't taking place. We have a massive road expansion programme, lot of work is going on in the social sector and we are focusing on things like agriculture, horticulture and improving education. I am not going to get into an argument with them. All calm is deceptive. London's calm was deceptive and then it spread to so many other cities. If it can happen in the UK, it can happen anywhere. I really do not want to join issue with these people; our entire effort has been focused on not giving an opportunity for these sorts of people to say, 'we told you so'. There have been incidents in the last few weeks that could have sparked trouble, particularly in Sopore and Swarankot for various reasons. There were incidents that could have provoked a huge reaction but, fortunately, like I said, people are (now)far more sensible about these things. What about your own style of working ? Has that changed too? Increased public contact has been the biggest change. After the conclusion of the Panchayat elections, I personally travelled to 34 Assembly constituencies so far and interacted with the Panches and Sarpanches. Interaction means I don't just speak to them but actually listen to what they have to say. I have an Open House once every week here in Srinagar which is open to anybody and without any appointment, provided you are not coming for jobs or transfers because these are the only two things I do not handle. It's basically for public demands and difficulties. My ministers are also a lot more mobile and I think the biggest change has been the public contact and making sure that the message gets out. Initially, I wasn't too keen to blowing my own trumpet. But then I realise there is no one that is going to do it for me, so I might as well do it for myself. After more than two and a half years in the saddle, do you feel more up to the task of being chief minister? Actually, I am even more apprehensive now than I was earlier because I know just how bad things can get, having lived through it last summer. I am now acutely aware of how quickly things can go from really good to really bad. I do not sleep well as I used to but that is fine as that is the nature of the job. I don't complain. So you do remain apprehensive about the situation in the state? Last year showed that in Jammu and Kashmir you take your eyes off the ball at your own risk and just because things are calm, it doesn't mean you don't have a problem. I think there are those in Delhi who tried to convince people that you just have one good election and you would not have an issue that needs to be resolved; clearly that is not the case. We might have had a good Panchayat election but that does not discount for the fact that there is a political issue and it needs to be resolved. Has the resumption of dialogue between India and Pakistan helped? A visible dialogue between India and Pakistan that touches on Kashmir does play a part on the psyche of people here. They want to see that this place is being talked about, that it's not being put on the back burner, that you are aware of the fact that this is an issue of Jammu and Kashmir and it needs a resolution. I am not interested in more trade routes; I am interested in actually operationalising the trade routes that exist. And it is my understanding that Pakistan is dragging its feet on one very important aspect of this trade which is to make it bankable trade rather than barter trade. This trade needs to take place on the back of a letter of credit, financial sort of relationships between banks. At this point in time you are sending me one kg of oranges and I am sending half a kg of lemon. The only way this trade will really work is if you make it trade on the basis of finance, that's one part of it. Then we come into opening other trade routes. It's unfortunate that on the one hand Pakistan tells the people here that they are their well-wishers. But every time something of importance comes up for us, they are the last people that we can count on. Do you have any examples of this doublespeak by Pakistan? Take the Indus Water Treaty. They quite happily took the three rivers for themselves, completely forgetting how that would impact the people here. On trade they are dragging their feet. Even simple things like giving over-flight permission is not being given which means international flights to Srinagar takes many more hours. Pakistan talks about giving moral and political support but when it comes to actually doing something to benefit the people we do not see it. The hardliners in the Huriyat conference accuse you of neglecting the main issue which they say is the dispute over Kashmir? 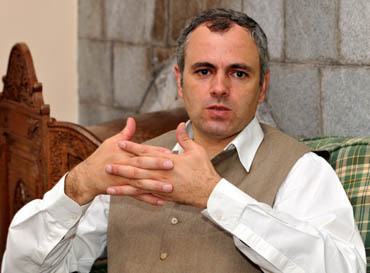 There are those who tried to hold development in Kashmir hostage, saying that look, do not participate in elections, don't have a government, don't do anything until the Kashmir issue gets resolved. The point I have been making to people is look, just because you participate in an election and you have a government doesn't mean that you are denying the existence of the Kashmir issue. The two have to be taken separately. Nor are we saying that just because I have given you a road and you got health infrastructure and education, you should turn out and say ab koi masla hi nahi hai. We were saying that there is the Kashmir issue and it needs to be resolved. But there are day to day issues as well which cannot wait. Home Minister P. Chidambaram had outlined an 8-point joint programme for restoring peace in the state last year. Has that been implemented? Some have been implemented and some are in the process of being implemented. The main one was to reduce the visibility of the security forces in Srinagar. We demolished about 39 bunkers, which I think was much needed and hasn't had any sort of adverse effect to the overall security environment in the city. Towards autumn or winter, we will start looking at what we can do on the Armed Forces Special Power Act. Has the process of having government interlocutors helped? It is unfortunate that there has been a clash of egos between them from time to time. I have urged the Home Minister on more than one occasion to try and sort the things out because at times it appeared as if they were more interested in talking among themselves rather than anything else. What's the message from the successful completion of Panchayat elections? The important message was that the people want to be empowered. The closer they are to the actual execution of power, the more involved they are. Our Assembly elections had a turn-out of almost 60 per cent, dropped to under 40 per cent for Parliament elections and then shot up to 77 per cent during the Panchayat elections. It clearly shows people want to be a part of the process. The Rangarajan Committee, which submitted its report to the Union Cabinet recently, has suggested measures for developing skills among youngsters in the state. What progress has been made so far? The key thing now is to identify the youngsters and match them to the corporate houses where they will undergo training and, hopefully, absorption. That is one part and the other is to get youngsters into various technical training courses either in the state or outside the state; the process of inviting applications and identifying the youngsters is being rolled out. In terms of technical education, it is anything between 50,000 to 100,000 youngsters who will get into ITIs and polytechnics etc for skill development. We are looking at a figure between 20,000 to 30,000 for absorption into the private sector and similarly about 40,000 to 50,000 over the next five to seven years into higher education courses like medical, engineering, IT etc in the rest of the country. How will this help improve the situation? It will create opportunities for youngsters outside of government jobs, because while I have a problem with unemployment right now, I also have a problem with employability. Even if I wanted to employ them, they do not have the skill sets required in the job market. I have today two major projects involving an investment of about Rs 25,000 crores. One is the Railway project and the other is the four-laning of the National Highway. If I have to add some of my big power projects also, I am looking at a capital investment of Rs 35,000 to 40,000 crores. There are more than enough job opportunities. But the problem is when I tell these companies to hire local people, they say, "we are ready but we do not find the skilled manpower". Now that is where I need to be able to create a pool of skilled youngsters so that when new projects are taken up, I will be able to give jobs to these youngsters. The estimates are that there are 5 million people unemployed in Jammu and Kashmir. What is being done to reduce these numbers? We have the Sher-e-Kashmir Employment Welfare policy which focuses on various aspects. One aspect is that some of the youngsters who fit the criteria are given unemployment benefit to help them for this period while they are looking for jobs. The second aspect is focus around skill upgradation through polytechnics and ITIs. The third aspect is to identify potential entrepreneurs and then help them with seed capital because one of the biggest problems is that they have ideas but they don't have money. We are trying to build a culture of self-employment which otherwise doesn't exist. What about industrialisation for the state that the Rangarajan plan also talked about? There has been some industrialisation but on a very limited scale. Not as much as we would like to see because of location constraints and power problems. We tell investors, please come and invest and set up a unit and bring a generator with you because we cannot assure you electricity. There was a package of initiatives and incentives that was given to J&K but unfortunately the same incentives were also extended to Himachal and Uttarakhand, which kind of defeated the purpose. We are trying to develop a local industrial pace; the handicraft sector has done well, horticulture is dependent on the vagaries of the weather and we had a Saffron Mission, which is yet to deliver results. We hope it will improve not only the quality of our saffron but also its marketing. There are certain initiatives that are being taken and hopefully they will deliver the results that we except. In terms of tourism, which is your biggest earner, why isn't private investment coming in despite the potential? Because of the absence of a guarantee of a decent season. If the private sector isn't sure that the next season is going to be as good as this season, why would it invest ? That is really the biggest problem, the lack of continuity. Every season something or the other goes wrong and it's not just these agitations; before this you had grenades thrown into tourist buses in 2006-07 and things like that. That again was largely because we made the cardinal mistake of equating tourism with normalcy. The moment you do that, you make tourists into targets. So we consciously this year underplayed the whole tourism factor. What has been your focus in terms of development? We have picked up the pace of development. We didn't want to start new programmes. Such programmes are usually political - you dust out old programmes, give them new names and roll them out. Our effort is really just to speed up what is anyway happening in power, road, health and infrastructure and let people see the visible use of that money; really that is what we are doing. A lot of on-going projects had been derailed because of the agitations during our work-seasons. All those we have completed. We had a large number of bridges and power receiving stations completed this year so that people will see a difference. Our primary focus, obviously, has been on keeping the situation as calm and peaceful as possible. The Anna Hazare campaign has shown that corruption is of much concern. You have recently passed a new Act to cut it down especially among the lower bureaucracy. Has it got off the ground? The Act was just passed in the recent Assembly session and the rules are being framed. It won't eradicate corruption but at least at the lower level, where it really bothers people, it will make a difference. The way government officers make money is due to their hold on clearances. But under the new law, once they know that they have to give it within fifteen days otherwise they would have to pay a penalty themselves, it would be a major disincentive.